Cornell University scientists have grown human ears from cow cells with the help of a 3D printer. Scientists use 3D printer to make new bones: How? This first-step work crafted a human-shaped ear that grew with cartilage from a cow, easier to obtain than human cartilage, especially the uniquely flexible kind that makes up ears. 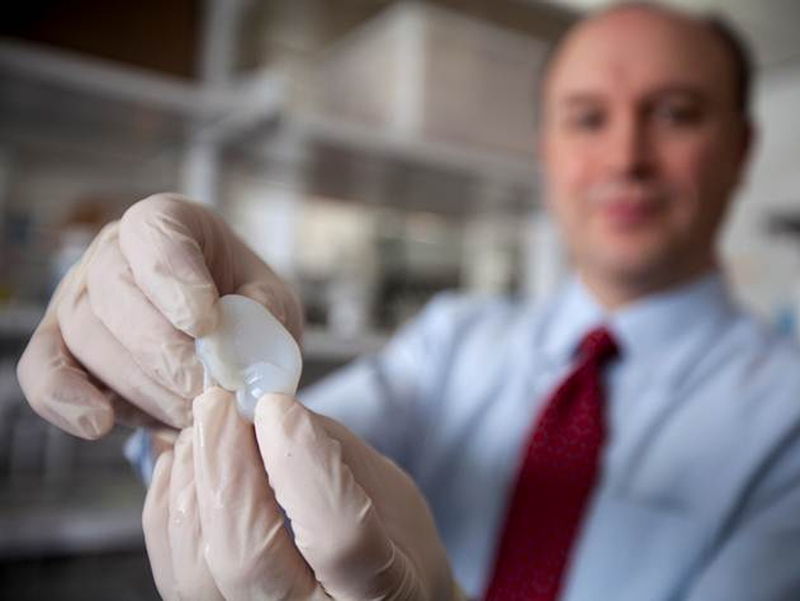 Study co-author Dr. Jason Spector of Weill Cornell Medical Center is working on the next step -- how to cultivate enough of a child's remaining ear cartilage in the lab to grow an entirely new ear that could be implanted in the right spot. Today, people who need a new ear often turn to prosthetics that require a rod to fasten to the head. Prosthetics are sometimes made out of artificial materials with a Styrofoam-texture, according to the Smithsonian blog. For children, doctors sometimes fashion a new ear from the stiffer cartilage surrounding ribs, but it's a big operation. Spector said the end result seldom looks completely natural. Hence the quest to use a patient's own cells to grow a replacement ear. The Cornell team started with a 3D camera that scanned a child subject's existing ear. The 3D camera beams the ear's geometry into a computer, without the mess of a traditional mold or the radiation if CT scans were used to measure ear anatomy. In the future, though, they hope to be able to reverse the 3D scan so it can create a mirror image of a healthy ear so they can replace a non-existing ear. From that image, the 3D printer produced a soft mold of the ear. Bonassar injected it with a special collagen Jell-O-like gel that's full of cow cells that produce cartilage - forming a scaffolding. The entire process took less than a day. "It takes half a day to design the mold, a day or so to print it, 30 minutes to inject the gel, and we can remove the ear 15 minutes later. We trim the ear and then let it culture for several days in nourishing cell culture media before it is implanted," Bonassar said in a press release. Over the next few weeks, cartilage grew to replace the collagen. The ears were then implanted underneath the skin on the backs of lab rats. Three months later, the grown ears were made out of cartilage cells and still kept its original shape. Now Bonassar's team can do the process even faster by using the living cells in that collagen gel as the printer's "ink." The 3D technology directly layers the gel into just the right ear shape for cartilage to cover, without having to make a mold first. The next step is to use a patient's own cells in the 3D printing process. If this can be done, researchers say that they hope to be able to implant and create an ear for a child when they are five to six-years-old and their ears have reached 80 percent of their adult size. Spector, a reconstructive surgeon, is focusing on children born without a fully developed external ear, a condition called microtia. They have some ear cartilage-producing cells in that tissue, just not enough. So he's experimenting with ways to boost those cells in the lab, "so we can grow enough of them from that patient to make an ear," he explained.